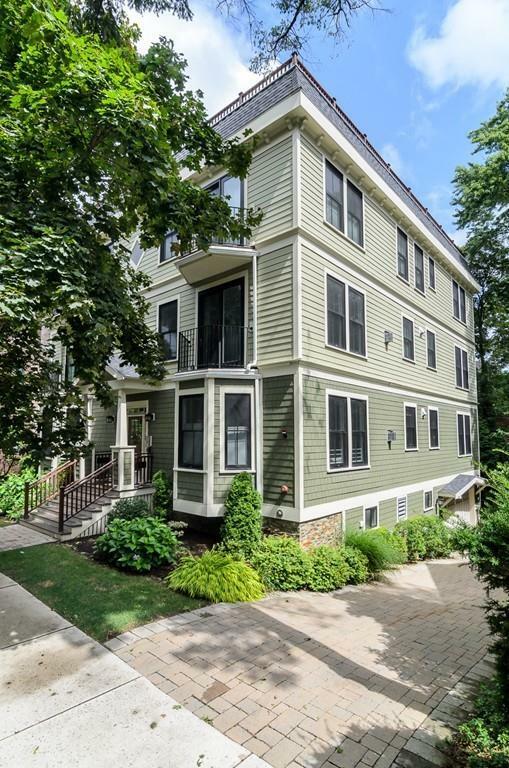 Incredible floor through, large 3 bedroom duplex condo in prime Brookline/Longwood location. New construction built in 2012, features high end appliances/fixtures/finishes, recessed lighting, large picture windows and sound system. Open layout is conducive to entertaining and comfortable living. First floor includes a large living room, kitchen with over-sized island plus Viking appliances, and gracious family/dining room. Top floor has three large bedrooms including luxurious master suite (with walk-in closet and master bath w/radiant heat), laundry room, hall bathroom and skylight. Home is replete with outdoor space throughout with a large deck off of family/dining room and master bedroom, front terraces off living room and bedroom along with a large shared landscaped backyard plus roof rights. A generous private storage room and 2 indoor parking spaces in heated garage complete this offering. Walk to Brookline Village, Coolidge Corner, Longwood Medical Area, T and Lawrence School. Listing courtesy of Rachel Goldman of Mgs Group Real Estate. Disclosures Taxes include Residential Exemption. Listing provided courtesy of Rachel Goldman of Mgs Group Real Estate.